Jan 1, 2016 | eNews Etc. Snow began to fall as the winter solstice approached, and continued daily for more than a week. 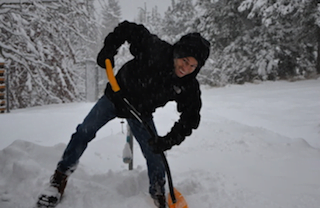 With about 30 inches of accumulation, the snow inhibited local travel, brought down power lines, and required some focused shoveling. It also sparked much rejoicing in the beauty and the gift of water for the land. Snow photos are here. Venerable Chodron and other monastics have been away, and we have had relatively few guests, so it has been a quiet time. You can check out the photos of Abbey Life. In 2016, may we cultivate the inner peace necessary to contribute to greater peace in our chaotic world. Venerable Chodron embarked on a teaching tour in Seattle, Singapore, and Bangalore, accompanied by Venerables. Semkye and Damcho as her assistants. Just before the long plane ride to Asia, she gave a talk at the American Evergreen Buddhist Temple in Seattle on “The Three Higher Trainings” organized by Dharma Friendship Foundation. The video is here. The teachings in Singapore began at Kong Meng San Phor Kark See Monastery, where many city-dwellers resonated with the topic of “Connecting from the Heart in an Age of Loneliness.” Listen to the audio here. 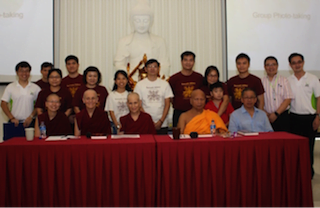 The next day, Poh Ming Tse Temple hosted the Singapore book launch of Buddhism: One Teacher, Many Traditions, with kind donors sponsoring 100 copies of the book for participants. Venerable Chodron spoke alongside her old friend Bhante Dhammaratana on the Four Immeasurables in the Pali and Sanskrit traditions. Audio of their talk is here. At the request of Buddhist volunteers, Venerable Chodron also led two closed-door workshops for people working with the prison population and the elderly. She shared her personal insights from decades of prison work, and led a discussion group on what motivates volunteers to work with the elderly. Buddhists in Singapore are doing much good social service, and the Abbey nuns were inspired. 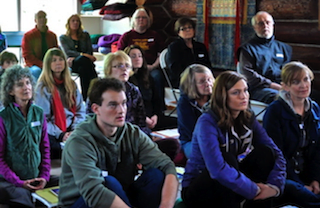 The tour culminated in a weekend retreat on “Karma and Your Life” organized by the Buddhist Fellowship. About 200 participants learned about the four principles and characteristics of karma, and contributed to a large pile of questions and lively discussions on right speech and forgiveness. The retreat ended with nearly 50 people taking or renewing their refuge in the Three Jewels. 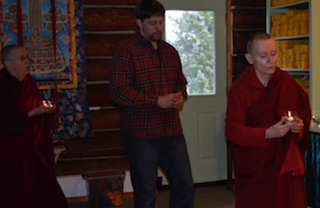 In between teachings, Venerable Chodron met with old friends and students who have stayed connected since she was the resident teacher at Amitabha Buddhist Centre from 1987-88. There was a joyous gathering with Abbey friends on Lama Tsongkhapa Day, when we did the Lama Chopa puja and gave thanks to volunteers. The Abbey nuns also toured the newly built premises of the Buddhist College Singapore and connected with the nuns’ community at Pao Kwan Foh Tang Temple. Venerable Semkye joined the Singapore teaching tour out of an aspiration to connect with friends who have supported the Abbey since its inception. 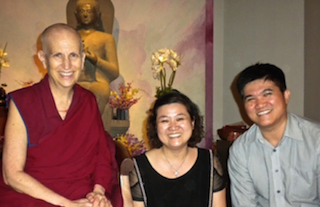 She enjoyed visiting with core members of Friends of Sravasti Abbey Singapore, and returned to the Abbey with a deeper understanding and appreciation for that Buddhist community and Venerable Chodron’s strong bond with her Singapore students. See the Singapore photos here. Venerables Chodron and Damcho continued on to Bangalore, India, where they were well and kindly cared for. Ven. Chodron was delighted to teach in India, where she grew up in the Dharma, repaying—in part—the kindness of her teachers and the Indian community. The Garden of Samadhi Mind Centre hosted a talk on “Dealing with Situations When Things Fall Apart” (audio is here) at the Srishti Institute of Art, Design, and Technology, which was well-attended by faculty, students, and the public. You can read the Times of India‘s interview with Venerable Chodron here. The Choe Khor Sum Ling Centre also hosted a talk on “Living with an Open Heart,” where Venerable Chodron touched on how practicing the Four Immeasurables helps us in our relationships with others. 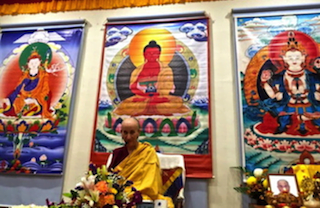 The two nuns then traveled to Bylakuppe for the fourth installment of His Holiness the Dalai Lama’s lamrim teachings. Their Internet connection has been sketchy, and their days have been full. We’ll get the full report from this part of their journey in the next eNews. A small group of friends and Abbey residents gathered to celebrate Lama Tsongkhapa Day and to hold a candlelight remembrance for all the people touched by gun violence, specifically in the U.S., but also throughout the world. The date fell just three days after the mass shooting in San Bernardino, which colored the day with urgency and purpose. Some people came to heal the violence in their past. Some came to talk openly of their concerns. All wanted to apply the Buddha’s teachings to understand the situation. Through the Abbey’s association with Faiths United to Prevent Gun Violence, we had the opportunity to screen a new documentary, Armor of Light, which follows an Evangelical minister and the mother of a teenage shooting victim who ask, is it possible to be both pro-gun and pro-life? For filmmaker Abigail Disney, the mission is to change the tone of public dialogue and open genuine conversation, which our group enthusiastically engaged in. We are very concerned about the epidemic of gun violence and see it as a public health crisis. Listen to what two public health experts say about this. After lunch, we did our Chenrezig practice and candle procession, sending the light of wisdom and compassion to beings everywhere, but especially for the victims of gun violence, the perpetrators, and also for people living in fear. The Lama Tsongkhapa Day celebration continued in the evening with a guru puja when we rejoiced at having met the Buddha’s teachings, especially as elucidated by Je Rinpoche. Photos of the day are here. 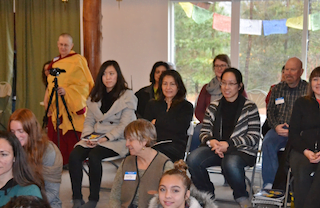 The day after the Lama Tsongkhapa celebration, we gathered with about 40 people for Sharing the Dharma Day. Which does not conceive the three spheres (as real). Venerable Tarpa skillfully gave the talk, making the topic of “Far-reaching Wisdom” accessible to the room full of mostly brand new people. After lunch, Venerable Jigme led the group discussion, which further demonstrated how we cling to false appearances. Photos are here. We will have one more Sharing the Dharma Day on January 10 before winter retreat begins. We were sad to miss the Youth Emergency Services (Y.E.S.) holiday party, where we connect with youth, families, and volunteers providing service to our county’s homeless teens. After a day of heavy snowfall—coupled with no county plow truck—we decided not to risk the drive. However, the many gifts offered by friends in the Spokane UU meditation class were delivered in time and the kids—as well as Y.E.S. and the Abbey—appreciate your generosity. 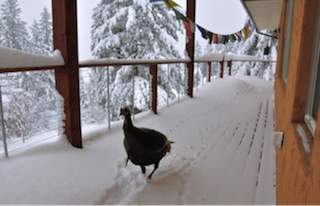 Heavy snow also affected our annual Christmas Day reading of Shantideva’s Engaging in the Bodhisattva’s Deeds. The power went out on Wednesday afternoon, and by Friday—Christmas Day—most of the buildings were pretty cold, especially the Meditation Hall. Ananda Hall connects to the generator, which we ran for several hours each day so people could still work, study, and get warm for a while. We canceled the guests who were planning to come, and moved the reading to Ananda. It was wonderful to engage all together with Shantideva’s clear direction for why and how to develop bodhicitta. And by early evening the county PUD crew fixed the line and power returned just in time to live-stream the Friday night teaching, a review of Venerable Chodron’s teachings on the Gomchen Lamrim. You can access both the Thursday and Friday live-streamed classes here. Several community members have had surgical procedures this month. Venerable Jampa received much kindness from Dr. Rice, Carol, Ruth, and others when she traveled to Seattle for sinus surgery. Venerable Jigme had surgery to repair a torn tendon, which will keep her off her feet for several months, and Venerable Losang had a procedure to correct a deviated septum. Everyone is recovering well and grateful for all the support. Lana, who ended her second three-month stay with us, was a superb nurse for Venerable Jigme’s early recovery days. Stephen is still here, cheerfully shoveling both snow and frozen earth to help fix a leak we discovered in the water system at Tara’s Refuge. Mary Louise is here for a two-week visit, and we so appreciate Kuni and her family when they make their regular visit to offer lunch to the sangha. 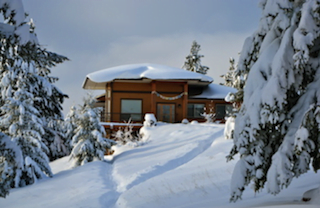 The Winter Retreat from Afar offers possibilities for beginning meditators and advanced practitioners to join in our annual meditation retreat at the level that works best for you. To participate, you commit to doing at least one daily session of Meditation on the Buddha, including reflection on one of the graduated path topics from The Easy Path to Omniscience, which Venerable Chodron taught extensively last year. More experienced meditators who have taken refuge and some of the lay precepts may want to do the refuge preliminary practice (ngondro), which includes 111,111 recitations of the refuge formula. You can also do the beautiful refuge practice as your daily practice without taking on the mantra commitment. Go here to learn more about Retreat from Afar, or write the coordinator to sign up. Yin Radio in Moscow, ID interviewed Venerable Chodron about her life and works. Listen here. You can also listen to the podcast of Wisdom Publications’ interview of Venerable Chodron. His Holiness the Dalai Lama called for action on climate change in a statement before the Paris summit. Watch the video statement here. Venerable Bhikkhu Bodhi is also speaking out about climate change. Watch his talk on the “Four Noble Truths of the Climate Crisis,” which he delivered at the White House. You can also download his paper on “Climate Change as a Moral Call to Social Transformation” from academia.edu. Inspired by talks Venerable Chodron has given recently about “Loneliness in Times of Connectivity,” Jordan penned his thoughts on the distracting influence of the Internet. 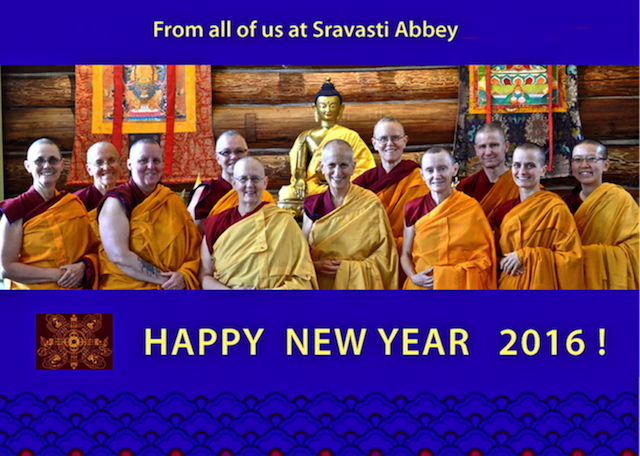 Northwest Dharma News published “Joys and Challenges Are the Focus of Monastic Life,” Venerable Chonyi’s report on the recent Western Buddhist Monastic Gathering at Sravasti Abbey. They also ran Kaisan Koro Miles’ version of the inspiring story we told you in October about the McNeil Island Special Commitment Center’s success in building a practice pagoda.